Aren't these flower toppers from Icing Designs gorgeous? Wouldn't they be perfect for Valentines Day..... or a sweet tea party.... or a ladies' luncheon.... or a bridal shower.... OK, LOTS of perfection here. And best of all -- cheap to make and easy, too! Got your attention yet? Only a few materials and a little hot glue required. 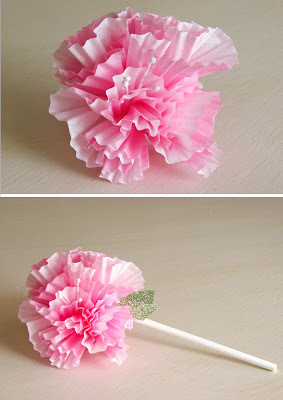 Choose cupcake liners to match your party, lollipop sticks, ribbon and some flower stamens (they used gum paste ones but you can find artificial stamens in the wedding section of Hobby Lobby, too, alongside the miniature silk flowers). Bunch the bottom portion of the liner together.... continue with the other liners, adding a little hot glue at the base of each one to glue them all together. Once you've got the flower the way you like it, add the stamen with a dab of hot glue and then glue the finished flower to the lollipop stick. Now you can use them as cupcake toppers or paper flower centerpieces. I think they would be beautiful strung together to make a garland.... or a vertical hanging garland. Wow, wow, wow - Lots of ideas! Thanks Icing Designs for the inspiration and the how-to. For more thorough instructions and even more photos, visit their blog. Beware.... you may be there for a while! It's yummy cute!